André-Sébastien Savoie. 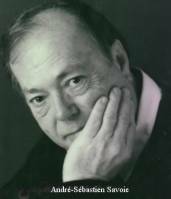 Pianist, accompanist, coach, teacher, born in Montreal on 25 Jul 1935. At first a pupil of Charles Reiner, he continued his studies 1952-8 at the McGill Cons. Winner of various competitions, and holder of scholarships from the Quebec government and the Canada Council, he worked 1958-62 with Carlos Vidusso in Milan, 1962-4 with Joseph Dichler at the Vienna Academy of Music, and with Geza Anda in Lucerne (summer 1968). Since his return to Montreal, Savoie has performed in numerous tours in Canada, the USA and in Africa, as well as on radio and TV. He has been soloist, recitalist, chamber musician and accompanist and has been the guest of renowned ensembles such as the Moscow Wind Quintet. He has premiered several Canadian works in recital and on recordings. In 1977 he was the soloist in a performance of André Mathieu's Concerto No. 3 ('Concerto de Québec') with the Tunis Orchestra under Raymond Dessaints at the Municipal Theatre in Tunis and repeated the work with the CMM summer concerts orchestra, conducted by Dessaints at the Maurice Richard Arena in Montreal. Savoie taught 1966-9 at Laval University and joined the faculty at the CMM in 1969. He is a brother of the baritone Robert Savoie. Extract from album : Just a few highlights to get rolling. Extract from album : This most profound cycle represents ultimate Lieder. Extract from album : Represents first half 20th Century German masters. Extract from album : Debussy to start with. We could use French contributors.